Washington State is by far the most important producer of Riesling in the US, and Chateau Ste. Michelle accounts for most of it, making over 1.2 million cases of Riesling annually. We recently sat down with Chateau Ste. 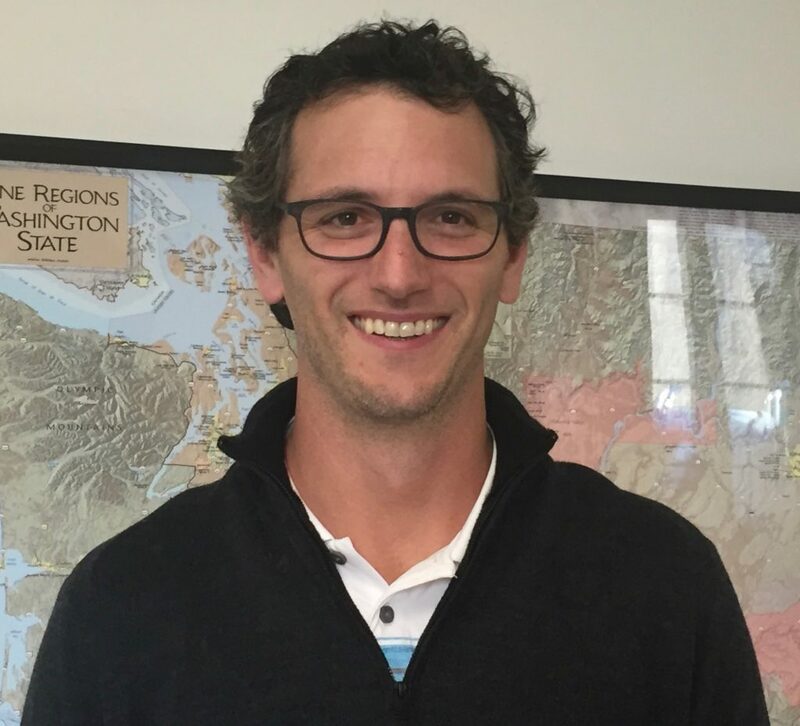 Michelle white wine maker David Rosenthal at the winery outside Seattle to talk and taste through their Riesling portfolio from the least expensive but delicious entry level Dry Riesling to the ultra-rich, super concentrated Single Berry Select Riesling dessert wine. Our reviews follow. With 6695 acres of Riesling, more than the entire country of Austria, Washington State is by far the most important producer of Riesling in the US. 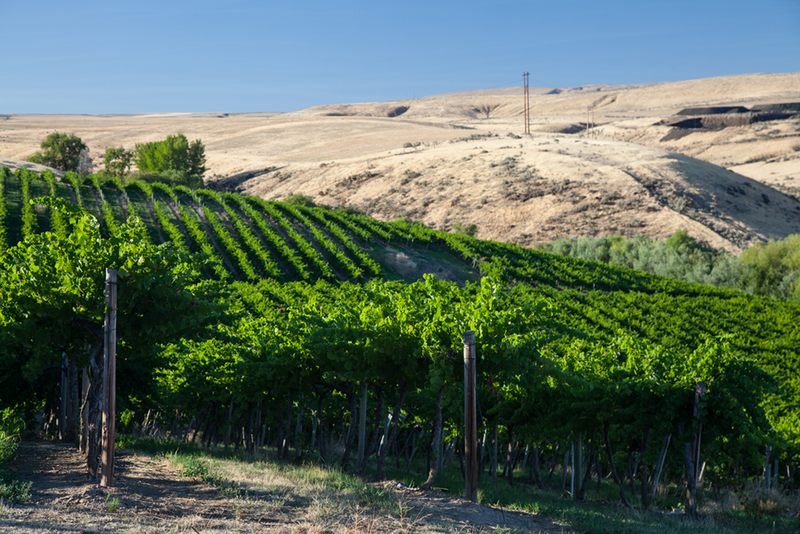 Although it has been eclipsed by Cabernet Sauvignon, Merlot, and Chardonnay in terms of acreage, Riesling is Washington’s grape. W.B. Bridgman first planted it on Snipes Mountain in 1917, and numerous growers planted it in the 1970s, thinking it was well suited to the cool climate. Chateau Ste. Michelle planted Riesling at its Columbia Valley Cold Creek Vineyard, and for many years it was the base for its highly regarded Eroica Riesling. Eroica, of course, is the wine first made in 1999 in collaboration with Ernst Loosen. The success of Eroica and the continuing partnership with Loosen has led Ste. Michelle to develop new expressions of Riesling, most recently the Eroica XLC Riesling, a wine inspired by Loosen’s grandfather’s traditional winemaking made in an upright oak cask with native yeast fermentation and extended lees contact (hence, XLC). But it turns out that the climate in much of the Columbia Valley, especially the Cold Creek Vineyard, isn’t all that cool. Today, Ste. Michelle sources fruit for Eroica from cooler vineyard sites, like the Evergreen Vineyard in the Ancient Lakes AVA, which in addition to cool weather has a unique, calcareous soil called caliche.. While plantings of Riesling exploded in Washington in the first decade of the 2000’s (see graph), they’ve remained relatively stable since that time. Chateau Ste. Michelle sources its Riesling, mostly machine harvested, from both estate and contracted vineyards. The fruit is whole cluster pressed, gently to minimize bitter phenolics. After pressing the juice is settled and then trucked to the winery in Woodinville outside Seattle for fermentation, blending, aging, and bottling. As our reviews below show, Chateau Ste. Michelle Rieslings range in style from dry to sweet, and quality is very good, often exceptionally so. At least as impressive to us is their incredible value across the range, from entry level Dry Riesling to Eroica Gold and Ice Wine. The impressive 2016 Eroica lists for just $20, and the re-release of the 2010 Eroica just $25. These are ludicrously low prices for wines of this quality. The Chateau Ste. Michelle Rieslings are made by winemakers Bob Bertheau, Ernst Loosen, and David Rosenthal. Chateau Ste. Michelle 2017 Dry Riesling Columbia Valley ($9) 89 Chateau Ste Michelle’s entry level Riesling is always astounding value. This one from the long, warm 2017 vintage offers delicate white and yellow stone fruit and floral scents, leading to rich orchard and citrus flavors with bright, lemony acidity. RS 6.3 g/L, 12.5% alc This is not a wine consumers are likely to lie away, but our tasting of the 7 year old, 2011 bottling blew us away with its complexity, depth and balance. Chateau Ste. Michelle 2017 Riesling Columbia Valley ($10) 89 This off-dry Riesling is Ste. Michelle’s standard bearer with 1 million cases produced annually. Despite 21 g/L residual sugar, the wine tastes almost dry with lovely white peach and orchard fruit aromas and flavors. It’s very clean, fresh, and balanced with a touch of natural CO2 that helps add an extra brightness. Chateau Ste. Michelle 2016 Cold Creek Vineyard Riesling Columbia Valley ($22) 90 The only single vineyard Riesling made by Ste. Michelle, Cold Creek is one of the hottest sites in the Columbia Valley and not ideal for Riesling. But Riesling was planted here 50 years ago on the advice of Walter Clore and André Tschelisteff, and the old vines and small berries contribute to good concentration and structure in the wine. The aromas are more tropical, and the palate rich in ripe stone fruit. The grapes were harvested over a four week period. 12% alc. Chateau Ste. Michelle 2016 Eroica Riesling Columbia Valley ($20) 92 Eroica is crafted by Dr. 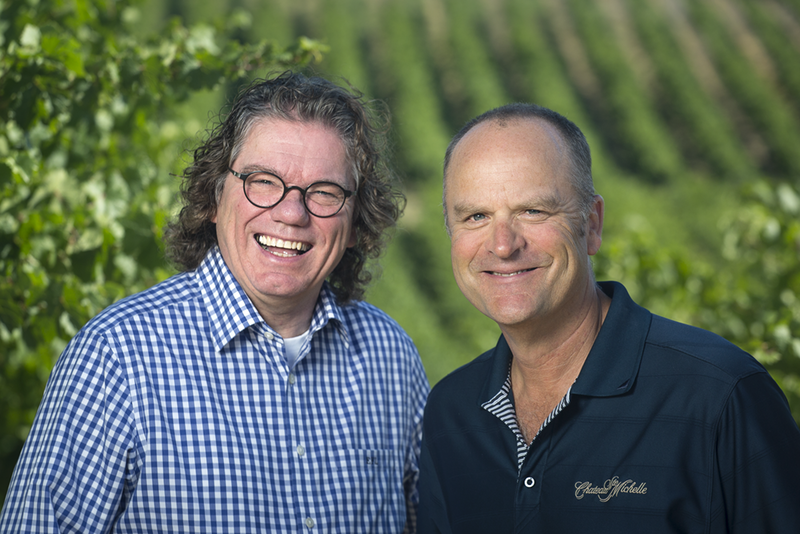 Loosen and David Rosenthal from select fruit of the best Riesling vineyards in the state, with 2/3 of the fruit coming from the Evergreen Vineyard in the Ancient Lakes AVA. It offers a seductive, perfumed bouquet with notes of yellow peach, zest of lime, and mint with an impeccable balance of acid and sugar and good depth of lychee, peach and citrus on a vibrant, lingering palate. RS 13.4 g/L; alc 12%. Another outrageous value. Chateau Ste. Michelle 2010 Eroica Riesling Columbia Valley ($25) 93 A library re-release in 2018 of the very cool 2010 vintage, which allowed for very long hang time and excellent acidity. The wine offers deep, layered stone fruit flavors and impeccable balance on a refined palate. More than half of the fruit for the 2010 vintage came from Yakima Valley’s Zillah Ranch vineyard. Chateau Ste. Michelle 2016 XLC Eroica Riesling ($65) 92 This is the inaugural vintage of the Eroica XLC, which is inspired by Loosen’s grandfather’s making of dry, lees aged Rieslings in the early 20th century. The wine is made from Evergreen Vineyard (Ancient Lakes AVA) fruit, fermented in an upright oak cask with ambient yeast and left on the full lees with no stirring and no sulphur. The 2016 vintage stayed on the lees for 12 months; the 2017 vintage will be on the lees an additional year. A bit reductive at this stage, it shows a white flower and mineral like nose and leesy citrus flavors. An intriguing, intellectual wine that will only show its best, like most Rieslings, with additional time in cellar. Chateau Ste. 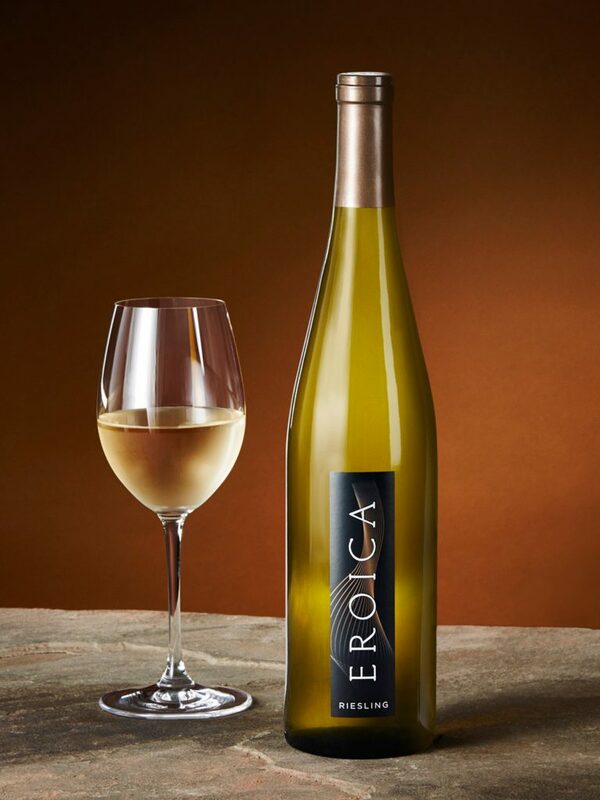 Michelle 2014 Eroica Gold Riesling Columbia Valley ($30) 91 Sourced mostly from Chateau Ste Michelle’s Horse Heaven Vineyard, about half botrytis-affected, the fruit was harvested in three picks at 32-35 Brix and fermented to under 10% alcohol, leaving 90 g/L RS. It reveals tangy, bright, ripe peach and apricot on an effusively perfumed nose and richly flavored, firm palate. Finishes on a crisp note with juicy persistence. Chateau Ste. 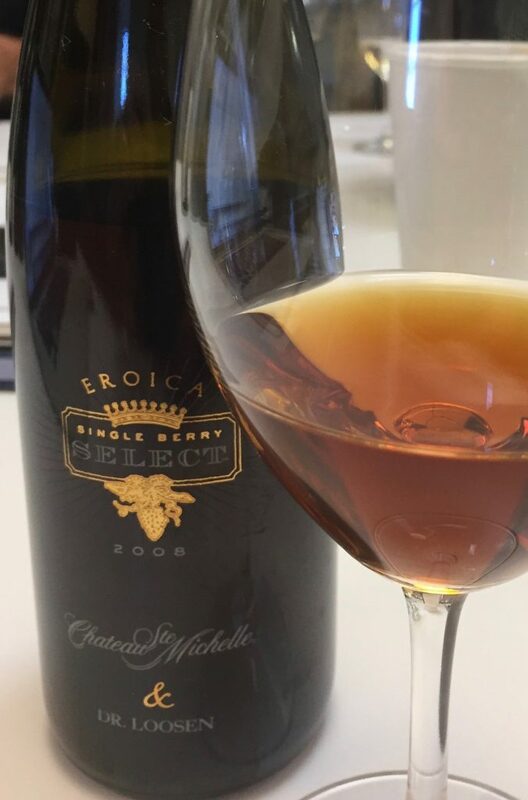 Michelle 2008 Eroica Single Berry Select Riesling Horse Heaven Hills 97 Made from 100% botrytis affected clusters in late October/early November at 55-65 Brix, it takes 3 to 6 months for this very high sugar wine to ferment to 7% alcohol. It’s then kept on the lees for a year before bottling by hand. Tangy, dried apricot and whiskey-infused orange marmalade show on the nose. The syrupy-rich palate shows candied stone fruit, carmelized nuts, and a hint of Pedro Ximenez sherry. A unique American dessert wine with some of the highest residual sugar (470 g/L) we’ve ever found in a sweet wine. This entry was posted in Uncategorized, Washington, White Wine, Wine Type and tagged Eroica, Featured, Loosen, Riesling. Bookmark the permalink.